Mission Medical Associates Blue Ridge Regional Hospital Hospitalist Practice, a Mission Health practice, is pleased to welcome William Dodd, MD. 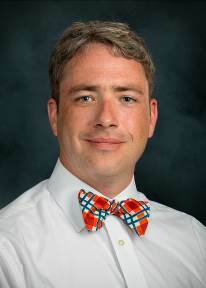 Dr. Dodd most recently completed his internal medicine and pediatrics residency at East Carolina University/Vidant Medical Center in Greenville, North Carolina. Dr. Dodd received his doctorate of medicine from James H. Quillen College of Medicine at East Tennessee State University in Johnson City, Tennessee. He is a member of the American Academy of Pediatrics, American College of Physicians and the American Medical Association. “My goal is to always provide exceptional medical care through effective patient communication and clinical knowledge,” said Dr. Dodd. “I am married to a psychologist and enjoy bicycling, walking the dog, amateur furniture building and working with computers." Dr. Dodd joins the Blue Ridge Hospitalist team, which includes James (Jim) A. Haaga, MD, Kevin R. Torrey, MD, and nurse practitioners Teresa Blanc and Beth Lingerfelt. The providers with Mission Medical Associates Blue Ridge Regional Hospital Hospitalist Practice manage the care of patients admitted to Blue Ridge Regional Hospital at 125 Hospital Drive in Spruce Pine, North Carolina.